In 1956, Humble et al. were the first to describe the term “emperipolesis” that includes the presence of a viable intact cell or cells within the cytoplasm of another cell. Since then, it has been reported in several conditions such as Rosai–Dorfman disease (RDD) (most commonly showing numerous intact lymphocytes engulfed by the histiocytes within their cytoplasm), idiopathic thrombocytopenic purpura, autoimmune hemolytic anemia, multiple myeloma, leukemia, malignant lymphoma, carcinoma, neuroblastoma, and giant cell carcinoma of lung., Emperipolesis has also been described in cases of inflammatory myxohyaline tumor and myelodysplastic syndrome. Emperipolesis in association with lymphoma is rare, with only few cases reported in the literature; most of them are based on tissue culture specimens, bone marrow aspirates, or cytology. RDD and lymphoma share significant overlapping clinical picture; however, they differ in their management protocol and outcome. Thus, it is of utmost important to be knowledgeable about the fact that emperipolesis does occur in a lymphoma. In view of rare association between emperipolesis and lymphoma in contrast to RDD, we present a case of a non-Hodgkin's lymphoma (NHL) with extensive emperipolesis including morphologic and immunohistochemical studies. A 52-year-old-male came to our hospital with abdominal lump and associated pain for the past 6–8 months. He complained of fever and loose motions for the past 6–7 days. In addition, the patient had a significant reduction in weight of 10 kg over a period of 6 months. History of breathlessness was also present. At the time of admission, the patient was febrile. General examination revealed pulse 110 beats/min, respiratory rate 24/min, and blood pressure 120/80 mmHg. Per abdominal examination, massive spleen was palpable which was extending beyond left coastal margin to reach below the umbilicus. Respiratory, cardiovascular, and central nervous systems' examination were within normal limits. The patient had a history of left-sided inguinal lymphadenopathy which was biopsied and reported outside as granulomatous lymphadenitis. At the time of admission, his laboratory tests showed normochromic and normocytic anemic picture (hemoglobin = 10.9 g/dL) with mild thrombocytopenia. Erythrocyte sedimentation rate (30 mm at the end of 1 h) and lactic acid dehydrogenase (880 U/L) were elevated. Serum electrolytes, liver function tests, and total proteins were within normal limit. Chest X-ray was within normal limit. Electrocardiogram depicted sinus tachycardia. Computed tomography (CT) of abdomen revealed massive splenomegaly that showed heterogeneously enhanced areas predominantly in upper pole. Linear nonenhancing areas were also noted in mid and lower poles of spleen, likely to be infarcts. Caecum displayed asymmetrical wall thickening with mild perilesional fat stranding. Also seen was a large mass attached to the liver. Enlarged lymph nodes of variable sizes were noted in periportal, aortocaval, and precaval regions. We received the right hemicolectomy specimen along with whole of spleen and part of the liver. The surgeon shared the intraoperative findings of a large peri-pancreatic lymph node which seems to be involved; however, it was not removed. Grossly, spleen was markedly enlarged measuring around 24 × 17 × 9 cm. The external surface was lobulated and congested. On serial slicing, there are multiple well-demarcated variable sized nodules that completely effaced normal splenic parenchyma. The cut surface appeared solid, homogeneous, yellow-white and firm, and showed large areas of hemorrhage [Figure 1]. 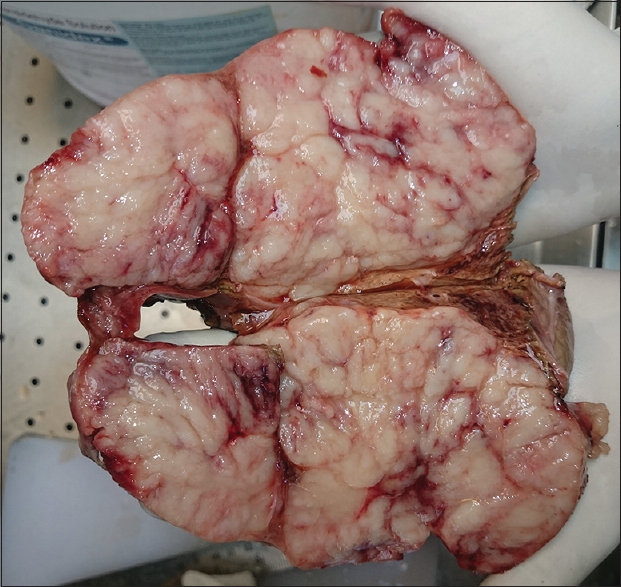 Part of liver received was measuring 15 × 7.5 × 4.5 cm and showed presence of well-demarcated tumor with similar above gross findings and compressed normal liver parenchyma at periphery. Multiple varying sized nodular masses with similar above gross findings, largest measuring 9 × 6 × 5.5 cm, were noted in mesentery of the caecum which was seen reaching the mucosa causing large areas of ulceration. Multiple sections through tumor mass of all three specimens were studied and microscopically showed similar histopathological findings in the form of diffuse proliferation of medium to large sized neoplastic lymphoid cells having irregular nuclear membrane, vesicular nucleus, prominent nucleoli, and scant eosinophilic cytoplasm [Figure 2]a. Mitotic figures were high. Intermingled, there are numerous large histiocytes with vesicular nuclei, distinct nucleoli, and abundant pale cytoplasm showing characteristic lymphophagocytosis along with few engulfed red blood cells (emperipolesis). Liver sections revealed tumor cells infiltrating the surrounding liver parenchyma. In addition to tumor deposits, some foci of well-formed epithelioid cell granulomas were identified in one of the sections from caecum. On further work-up, normal serum ferritin level, hypercellular bone marrow with no hemophagocytosis, and absence of other criteria helped us to rule out hemophagocytic lymphohistiocytosis syndrome. Immunohistochemistry performed on tissue sections showed that the neoplastic lymphoid cells were diffusely positive for CD19 (membranous) [Figure 2]b, CD20 (membranous) [Figure 2]c, and MUM1 (nuclear; 40%–50%) [Figure 2]d; focally positive for CD43 (membranous); and are negative for CD3, CD5, CD23, Bcl2, MPO, and EBV-LMP. Bcl6 immunostain showed very focal nuclear immunoreactivity (<5%) [Figure 2]e. Histiocytes showing emperopolesis were highlighted by CD68 [Figure 2]f. Ki-67 labeling index was 80%–90%. According to the Real European-American Lymphoma/World Health Organization 2017 classification (REAL/WHO 2017) and taking into account the clinical inputs, CT findings, histopathological, and immunohistochemistry examination, the tumor was classified as diffuse large B-cell lymphoma (DLBCL) and activated B-cell phenotype with extensive emperopolesis. Emperipolesis, first described by Humble et al. in 1956, is a condition in which viable hematopoietic cells are seen in the cytoplasm of host cells that may be in the form of megakaryocyte, monocyte, endothelial cells, fibroblast, or malignant cells. In contrast to phagocytosis, emperipolesis shows the absence of destruction of the engulfed cell and host cell. To our knowledge, Overholtzer et al. recently presented a new term called “entosis” that depicts a homogeneous cell-in-cell phenomenon and a striking similarity to emperipolesis. Taking into account very few case reports in literature, emperipolesis and lymphoma shared rare association. In comparison to Hodgkin's lymphoma, emperipolesis has been noted more commonly in NHL. Not to forgot that most of these cases displayed emperipolesis in bone marrow aspirate, tissue culture studies, or cytology. In our case, the initial impression of RDD on hematoxylin and eosin sections was a mislead diagnosis on the basis of emperipolesis. As we know that RDD, a benign proliferative disorder of histiocytes, has an indolent clinical course with most of the patients undergoing complete resolution without any treatment. By performing immunohistochemistry, we come to know the immunophenotype of the lymphoma (DLBCL) showing extensive emperipolesis. Among few related case studies on tissue sections, Lopes et al. in 2003 showed a case of diffuse B-cell lymphoma with emperipolesis. Their results had the support of ancillary techniques such as immunohistochemistry and electron microscopy. Talking about the additional histopathological finding of epithelioid granulomas in one of the section of caecal mass and previous left inguinal lymph node, we think this could be a precursor lesion that must have lead to presentations of RDD which further turned to be lymphoma. This could be further substantiated properly using molecular studies AND ancillary technique. Lack of awareness of occurrence of emperipolesis phenomenon in a lymphoma leads to misdiagnosis and delay in management and treatment. Through our case and few previous related literatures, we just want to conclude that whenever a patient comes with such type of clinical presentation along with emperipolesis in lymphoid background on histopathology, always think of lymphoma with extensive emperipolesis as a mimicker to RDD and it should be further confirmed on immunohistochemistry. Humble JG, Jayne WH, Pulvertaft RJ. Biological interaction between lymphocytes and other cells. Br J Haematol 1956;2:283-94. Foucar E, Rosai J, Dorfman RF. Sinus histiocytosis with massive lymphadenopathy. Current status and future directions. Arch Dermatol 1988;124:1211-4. Djaldetti M, Strauss Z. Emperipolesis by megakaryocytes in patients with non-Hodgkin's lymphoma and megaloblastic anemia. J Submicrosc Cytol 1982;14:407-13. Kinkor Z, Mukensnabl P, Michal M. Inflammatory myxohyaline tumor with massive emperipolesis. Pathol Res Pract 2002;198:639-42. Sable MN, Sehgal K, Gadage VS, Subramanian PG, Gujral S. Megakaryocytic emperipolesis: A histological finding in myelodysplastic syndrome. Indian J Pathol Microbiol 2009;52:599-600. Overholtzer M, Mailleux AA, Mouneimne G, Normand G, Schnitt SJ, King RW, et al. Anonapoptotic cell death process, entosis, that occurs by cell-in-cell invasion. Cell 2007;131:966-79. Lee KP. Emperipolesis of hematopoietic cells within megakaryocytes in bone marrow of the rat. Vet Pathol 1989;26:473-8. Poppema S. Sternberg-reed cells with intracytoplasmic lymphocytes. Phagocytosis or emperipolesis? Virchows Arch A Pathol Anat Histol 1978;380:355-9. Lopes LF, Bacchi MM, Coelho KI, Filho AA, Bacchi CE. 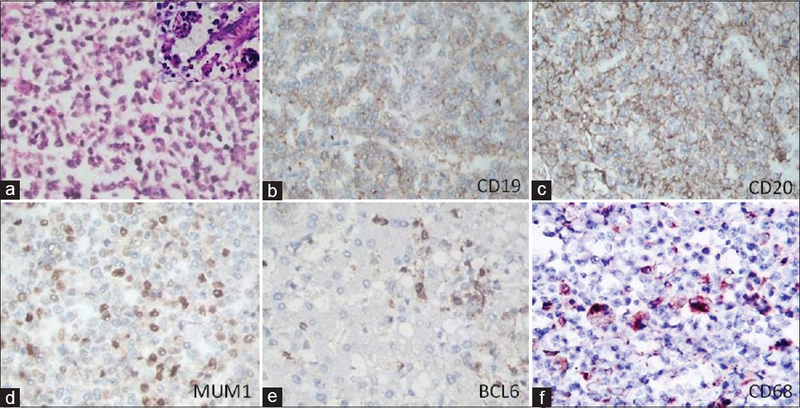 Emperipolesis in a case of B-cell lymphoma: A rare phenomenon outside of Rosai-Dorfman disease. Ann Diagn Pathol 2003;7:310-3. Amita K, Vijay Shankar S, Abhishekh MG, Geethalakshmi U. Emperipolesis in a case of adult T cell lymphoblastic lymphoma (mediastinal type)-detected at FNAC and imprint cytology. Online J Health Allied Sci 2011;10:11.